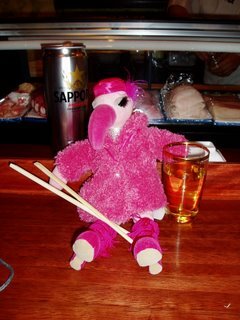 Flo had a great evening last night having Sushi for the first time. She confided in me that she's had tons of raw fish in her day but never something like this. She felt all refined and stuff eating with those prongs they gave her. If you haven't checked on Flo in a while click on her picture to see what she's been up to!